With the same sensor as the G9? With its new full-frame S series cameras now starting to ship to customers, Panasonic appears to be on the cusp on launching a new mirrorless model, possibly a replacement for its G85/G80 model (pictured above). Rumors of a new G95 model, which may go by the name G90 in some territories, have been growing stronger since images purportedly of the new camera were published by Japanese camera-leaking website Nokishita. The model would potentially serve as the official replacement for the G85/G80, which launched in 2016. The G85 is already a competitively specced camera for its class, but we expect a number of new upgrades for this release. Rumors – and logic – suggest the G95 will inherit a newer 20MP sensor, possibly the same unit that has featured in the G9. This may well spell the end of the 16MP sensor that Panasonic has used inside the G85 and elsewhere, which looks dated against current-generation cameras. 4K video recording will almost certainly see some kind of upgrade, possibly with a 60p option at its maximum resolution, and we also expect to see a High Res Shot mode, with the new camera able to output images at the same 80MP resolution as the G9. Other expected changes include a USB 3.1 port to replace the G85’s aging USB 2.0 socket, together with faster continuous shooting options. 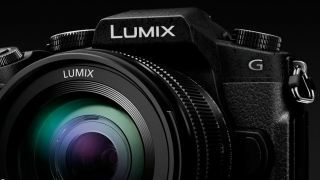 The images we've seen show the model to closely resemble the G85, although there are differences that bring it more in line with some of Panasonic’s recent releases. On the rear, for example, it swaps the G85’s four-way menu pad for a scroll wheel, much like the GH5S and G9. It’s also been furnished with the familiar triplet of ISO, white balance and exposure compensation controls on the top plate, where the G85 holds Fn1 and record buttons. The model retains the DSLR form and twin-command-dial control of the G85, and features physical dials for exposure and drive modes. It’s also been designed with a flip-out LCD screen, which we expect to have the same 1.04 million dot resolution as before, and as much as we’d like the excellent 3.69 million-dot viewfinder from the more senior G-series bodies, it's perhaps more realistic to expect viewfinder resolution to stay at 2.36 million dots. We’ll bring you all the details once the model is officially announced.